I had every intention of sharing this recipe yesterday, but a little thing called Orange is the New Black had me thoroughly distracted. However, we have now completed the season so I can move on with my life until next June, and focus on other important things such as extremely excellent veggie tacos. (Feel free to start a spoiler thread in the comments to discuss if you have watched!) My man (in the “I adore his restaurants and wish we were great friends and neighbors” sense) Rick Bayless recently released a new cookbook and you better believe I bought it at the first opportunity. As expected, it is full of many recipes I can’t wait to try but when I saw these tacos there was no question that they would be the first thing we tried. I have previously discussed my quest for good meatless taco options. These spicy black bean tacos are one of our favorites and they can hardly be beat for speed and convenience. 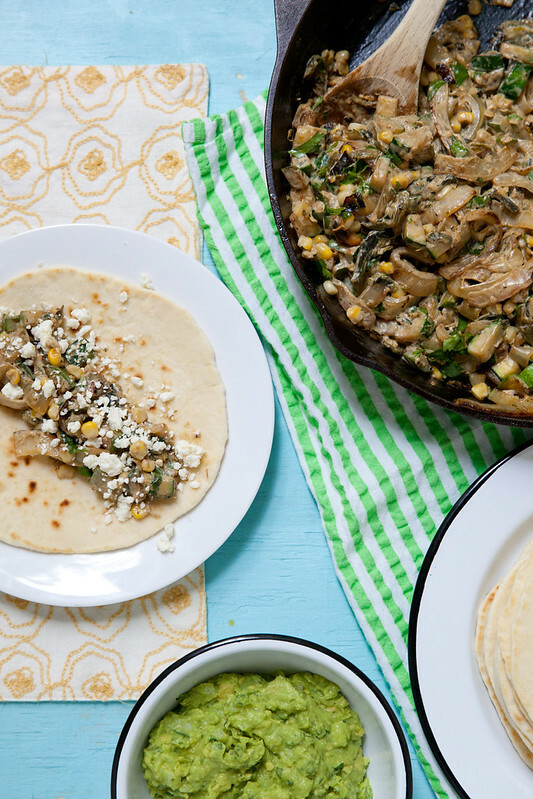 This version is a different take, chock full of veggies including roasted poblanos. The mixture is filling and satisfying but not at all heavy. Topped with some guacamole and crumbled cotija and wrapped in homemade tortillas, these are definitely a new favorite of ours. In fact, we loved them so much that we made twice in three days! The leftovers have also made for numerous great work lunches for me. 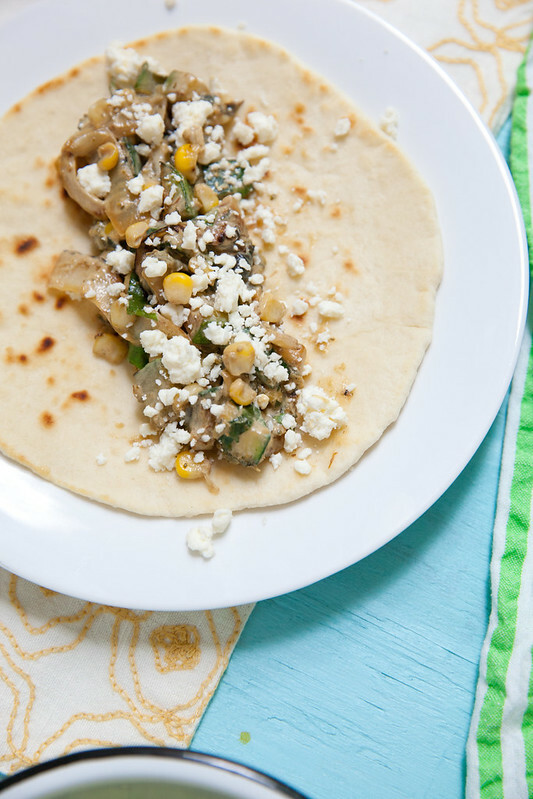 This recipe will be especially welcome later in the summer when our zucchini plants are flourishing and the farmers markets have a bounty of corn. Enjoy! Preheat the broiler with an oven rack 6 inches from the heating element. Place the poblanos on a foil lined baking sheet. Place under the broiler and cook, turning as needed, until the skins are blackened and blistered on all sides. Remove from the oven, transfer to a medium bowl, and cover. Let stand for at least 15 minutes. Once cool enough to handle, peel away the skins and discard. Seed and slice the peppers into strips. Set aside. Heat 2 tablespoons of the oil in a large skillet over medium-high heat. When the pan is hot, add in the onion and cook, stirring occasionally until the onion is well browned but still slightly crunchy, about 7 minutes. Stir in the garlic and oregano. Once fragrant, stir in the roasted poblanos and the crema. Add in the salt. Stir until the mixture is evenly combined. Remove from the heat and set aside. In a second large skillet, heat the remaining 1 tablespoon of oil over medium-high heat. When the pan is very hot, add the zucchini. Cook, stirring frequently until the zucchini pieces are well browned on all sides. Stir in the corn kernels and let brown, about 2-3 minutes. 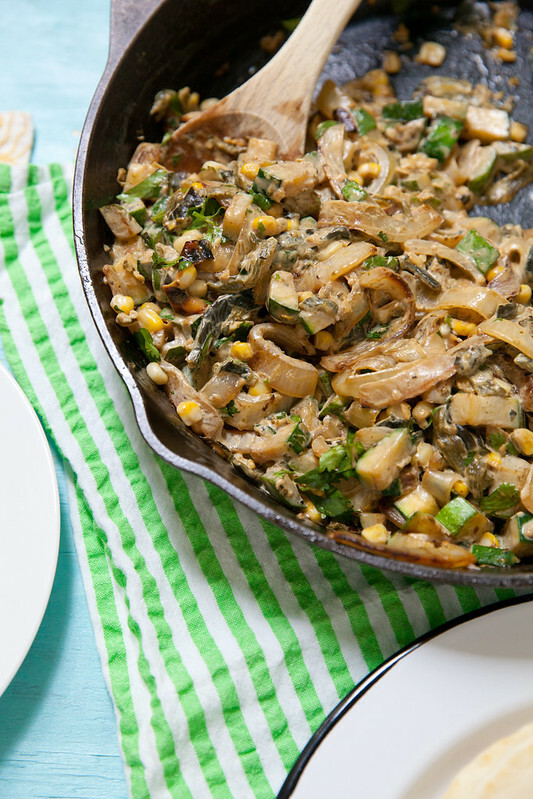 Stir in the entire poblano-onion mixture. Add in the cilantro and stir just until combined. Remove from the heat. Serve the mixture warm with fresh tortillas, guacamole and crumbled cotija.